Because the U.S. Flag is the symbol of our country, it should always be displayed in the most prominent, most honored position. No other flag should ever appear more important. The flag of the United States is a living symbol that calls to our spirit, reminding us of the greatness of America. We cherish and uphold it because it is the standard of honor under which we live. 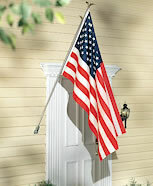 The proper name of the nation’s symbol is the United States Flag; however, it is sometimes referred to as Old Glory. On a Wall: When the flag is displayed on a wall, it should be displayed with the union uppermost and to the observer’s left. Among Subordinate Flags: When the U.S. Flag is among a group of subordinate flags, the U.S. Flag should be at the cent and at the highest point — the position of prominence. On a pole: When several flags are flown from the same pole, the U.S. Flag should always be at the top — except during church services by naval chaplains at sea when the church pennant may be flown above the U.S. Flag on the ship’s mast. On a lapel: When the flag is displayed as a lapel pin, it should be worn on the left lapel — near the heart. At Half-Staff: Flying the U.S. Flag at half-staff is an honored tradition which signifies that the nation is in mourning due to the death of a prominent citizen. To position the flag at half-staff, first hoist the flag to the peak of the staff for an instant before lowering it to the half-staff position — roughly halfway between the top and bottom of the staff. Before lowering it for the day, raise the flag again to the peak for an instant. 1. To fold the flag correctly, bring the striped half up over the blue field. 3. Bring the lower striped corner to the upper edge, forming a triangle. 5. When you get near the end—nothing but the blue field showing—tuck the last bit into the other folds to secure it. 6. The final folded flag resembles a cocked hat with only the white stars on a blue field showing. …and such other days as may be proclaimed by the President of the United States or on State and Local Holidays.